I remember the first time that I went to Bäco Mercat. I was having drinks with a friend Downtown at The Varnish and after a few too many, we realized that we needed to eat something. Cole’s wasn’t serving anymore and the bartenders suggested we go around the corner to a new place that had just opened that was serving late. I remember how good the flatbread was that we had and vowed to return. Since then I have been back to Bäco Mercat a few times, each time trying new things. A recent evening before heading to the theater, we ate at Bäco Mercat again and I was reminded how consistently reliable and tasty Josef Centeno’s restaurant is. In every region in Italy, there are specialty food products as well as the wines produced. So of course the ideal way to taste wines is paired with one of these local products. For the most recent wine seminar from the North American Sommelier Association, the wines of Emilia Romagna were paired with Prosciutto di Parma. Yum! Emilia Romagna is known for Ferrari, Lamborghini, Maserati, Ducati and Bugatti; it is home to the world’s oldest university in Bologna and is the cultural and political link between the North and the South. 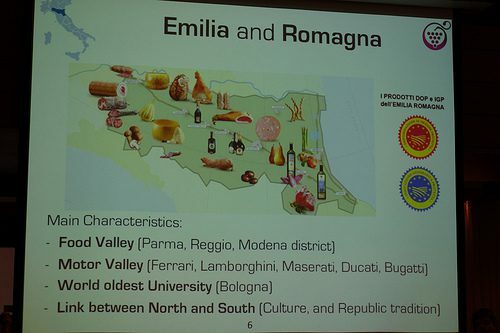 Emilia Romagna is also known for Parmigiano Reggiano, Balsamic Vinegar from Modena, Prosciutto di Parma and Lambrusco.